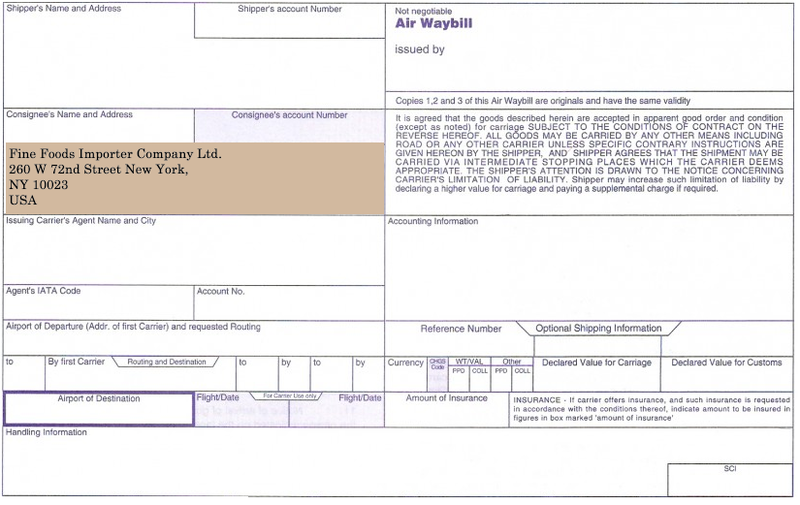 How to complete consignee and notify fields on an air waybill? Air waybill is a non-negotiable transport document, which is issued by the air cargo carrier or its agent on behalf of the carrier, used in international air shipments. Just like other non-negotiable transport documents, air waybills cannot be issued "to order" or "to order of a named company (such as banks)". As a result air waybills must be issued straight, in other words, consigned to a named company. Today I would like to explain consignee and notify fields of the air waybill and how to complete them correctly. What does consignee mean on air freight shipments? According to terms of the contract of carriage stated on the reverse side of the air waybill, the consignee is either the individual or entity who is financially responsible for the collection of the goods from the carrier at the airport of destination. In a simple export and import transaction, where neither letter of credit nor cash against documents payment methods have been used, it is expected that the consignee is the buyer or importer. Under letter credit, consignee may be the issuing bank and under documentary collection, consignee may be the presenting bank. How to complete consignee field on an air waybill under cash in advance or open account payments? Under cash in advance and open account payments, exporters and importers complete the transaction without interfered by a 3rd party such as a bank. Shipping documents are sent directly to the importer by the exporter via express courier or registered postal services. As there is no 3rd party exists in the transaction, air waybill is expected to be consigned direct to the importer company under cash in advance and open account payments. 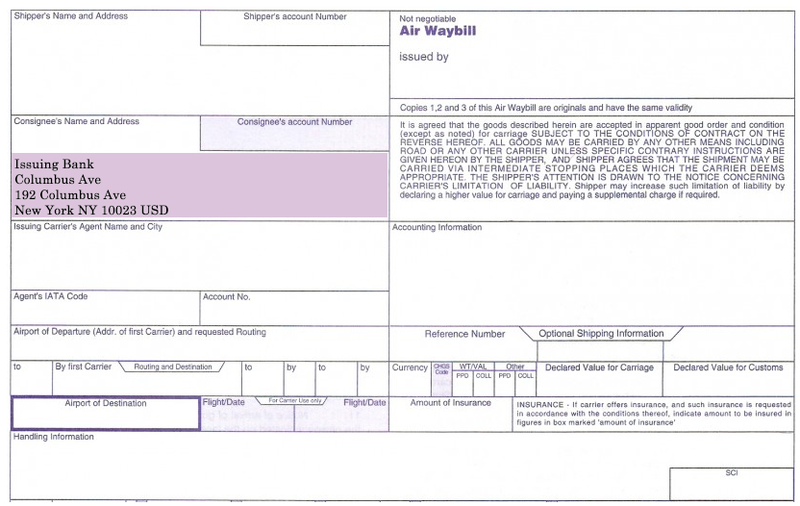 How to complete consignee field on an air waybill under cash against document payment method? Although it is not possible to consign a transport document to a bank without having the bank's advance acknowledgement as per documentary collection rules (URC 522), it is a customary act consigning the air waybill to the presenting bank, who is making presentation to the importer. 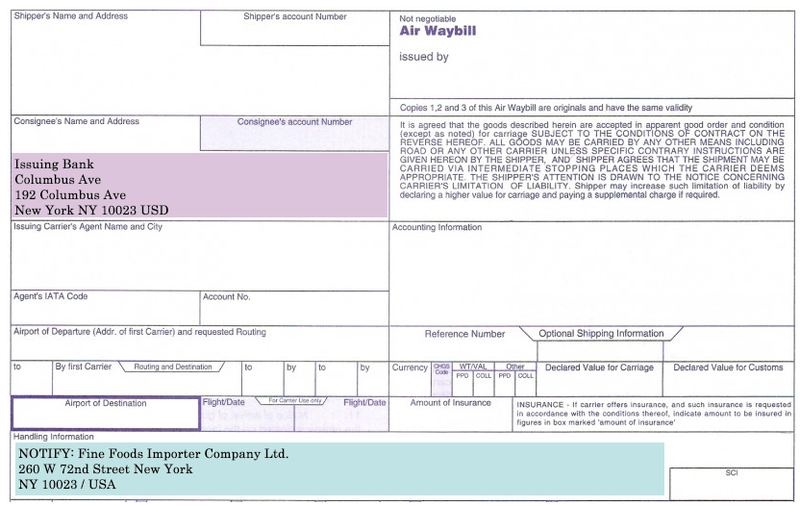 How to complete consignee field on an air waybill under letter of credit payment method? Consignee field of an air waybill should be completed according to letter of credit instructions. In most cases issuing banks demand that the air waybills must be consigned to the issuing banks. What does notify mean on air freight shipments? Notify party on an air waybill means the person or company, whom will be advised by the carrier's agent once the goods arrive at the airport of destination. Unlike bill of lading, there is no notify party field exist on IATA standard air waybill format. As a result a Notify Party must be inserted in box 21 (Handling Information) or in box 5 (Consignee's Account Number). How to complete notify field on an air waybill under cash in advance or open account payments? As air waybill is expected to be consigned direct to the importer company under cash in advance and open account payments, there is no need to indicate notify party on the air waybill under cash in advance and open account payments. How to complete notify field on an air waybill under cash against documents or letter of credit payments? As air waybill is expected to be consigned to the issuing bank under a letter of credit payment and to the presenting bank under a cash against documents payment, a Notify Party should be inserted in box 21 (Handling Information) or in box 5 (Consignee's Account Number). What are the differences between voyage and time charter parties? What are the main differences between 40FT and 40HQ containers? What are the differences between CIF and CIP Incoterms? What Does “Freight Collect” And “Freight Prepaid” Mean on a Bill of Lading? How many Euro Pallets and Standard Pallets fit in a curtainsider trailer? What are the differences between Institute Cargo Clauses A and Institute Cargo Clauses C? How many Euro Pallets fit in a 40 FT container? Are “Freight Collect” and “Freight Prepaid” terms described in Incoterms 2010? Who can issue and sign insurance policies? The articles written on this website are not to be construed as being other than solely for benefit or guidance and there should be no legal imputation associated with the opinions offered. Neither the owner nor any of its employees, nor any other person acting as a guest blogger, nor this website, shall be liable to any person for any loss or damage arising out of any act or omission in connection with the published articles.